In typical Xiaomi fashion, the company has taken the wraps off its next iteration of the Redmi budget showstopper via a forum post announcement. Like a lot of Xiaomi products, the Redmi 3 offers some very good specs at a price that is unbelievable. So without further ado, let’s take a look! The Redmi 3 features a metallic unibody design with a 5″ HD LCD display on the front. 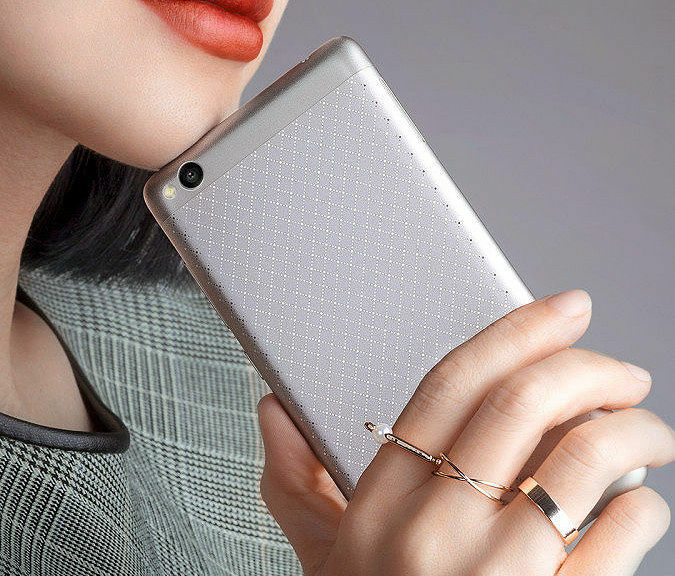 On the back, the Redmi 3 features a plaid design which adds an interesting flavor to the exterior. If you are not a fan of the design, there’s also one color variant that will be available without the design, so options are always good. The dimensions of the device are 139.3 x 69.6 x 8.5 mm, which when compared to the dimensions of the 4.7″ Redmi 2 (134 x 67.2 x 9.4 mm) seem improved upon significantly when you take into account the increased battery as well. On the inside, the Xiaomi Redmi 3 features a Qualcomm Snapdragon 616 Octa Core processor, with 4 cores clocked at 1.5 GHz and also 4 cores clocked at 1.2 GHz. The Adreno 405 takes care of the GPU department, with 2GB of LPDDR3 RAM to keep apps ticking comfortably. The Redmi 3 also features 16GB of internal memory, which can be expanded upto 128 GB if you’re willing to give up the second SIM slot. The device also packs in a large (albeit non-removable) 4,100 mAh battery which supports quick charging up to 5V/2A. For the camera, the Redmi 3 packs in a 13MP rear shooter with PDAF and a 5MP front camera. Sensor information was not readily available, but we can expect the device to be on competing terms with other low-mid end devices on camera performance. The Xiaomi Redmi 3 ships with MIUI 7 based on Android 5.1.1 Lollipop, and will be available in four color options: Gold, Dark Grey and Metallic, and a Gold color variant without the lattice design on the back. For the price, the Redmi 3 matches the Chinese launch price of the Redmi 2 at CNY 699. Currency conversions to USD make it sweeter at just about ~$105 compared to the ~$112 launch price of the Redmi 2. The Xiaomi Redmi 3 goes on sale in select stores in China as well as mi.com from tomorrow, 12th January 2016. Global availability of the device is unknown, but we do expect the phone to reach several emerging economies in Asia. What are your thoughts on Xiaomi Redmi 3? Will you purchase this device if it is officially sold in your country? Let us know in the comments below!